Is not free for peach ? I use before Wrobot free just for peach. The bot is amazing but I can't manage to get fight classes profiles. Neither download them... I'm gonna try and create my own. the link to SlimDX doesn't work atm. i dont no much about computers so can someone please help me out thanks. Your UAC settings just warning you for running an executable file. How long it take to get me key after payment, still no mail come? Hello, if you play on official server use default WRobot version. were do i find my licenses key ? I purchased your "trial" product (that is the 3 day version) and am having some trouble getting it to work. I am playing on a private 3.3.5 server and am wondering how to get this program up and running. I was about to purchase the "Private server" package, when I read the fine print which stated that there are no refunds, so I thought my best option would be to reach out to you guys in an attempt to trouble shoot this instead. I have downloaded the file, unzipped and launched it and am currently stuck where the it tells me to "Please select a game Product and connect to the game" and upon pressing "OK" it lets me launch WoW. However, when I look at the Bot, it reads "43896 - Game version incorrect". Any advice on where to go from here? any help in this regard would be greatly appreciated. Sorry in advance if I am in the wrong forum, I am not all that familiar with how these things work. Pra usar 1 x ja tem que pagar? Hey Drioidz, Can I use WRobot in EU Servers? 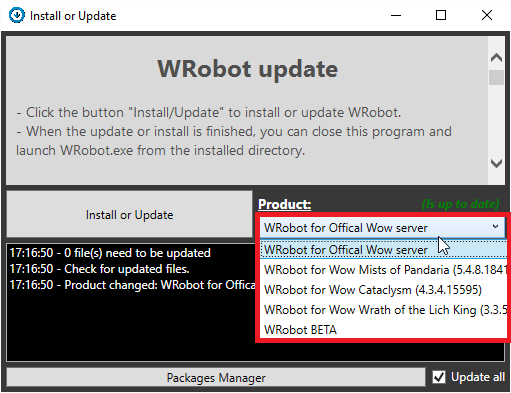 hi, i have just paid for this but i cant use it because wrobot is not on current version of wow (wow is 24367 and wrobot supports 24330) please help. tem suporte para brasileiros ? Hello, I play on the private server " wow ascension " I was wondering if this bot service works on that private server? I was wondering if I could get a trial key to test it out before purchasing as well?